We are counted amongst reckoned names in the industry, committed towards manufacturing a wide gamut of LLDPE Stretch Film. - Used for food wrapping and other packagings. 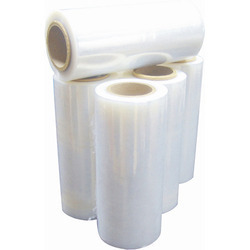 Multi-layer Manual Machine Grade LLDPE Stretch Wrap Film from 75 MM to 1625 MM Width 12 Micron to 60 Micron Thickness. for Manual as well as Machine wrap application. recovery keeps the items tightly bound.